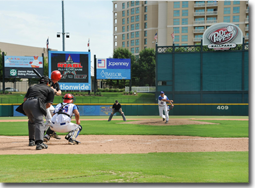 On behalf of the North Texas Amateur Baseball League (NTABL), Frisco RoughRiders and Dr Pepper Snapple Group, thank you for supporting the All-Star Games to be held at Dr Pepper Ballpark on Sunday, July 29, 2018. Last year’s event netted over $29,000. The “kid-friendly” event includes four games featuring the area’s best amateur baseball players age 18 and older beginning at 8:30 a.m. and running throughout the day. All tickets will be held at the main gate under the name on the credit card or check received. For the event Title Sponsorship opportunity, NTABL sponsorship, advertising, interviews or other information, please email m.adams@qht.com or call 214-609-7289 or visit www.ntabl.com. For more information about TSRHC, to volunteer or to make a donation, please call 214-559-5000 or 800-421-1121 or visit scottishritehospital.org. TSRHC is a 501(c)(3) charitable organization and your gift is tax-deductible to the full extent provided by law. Please consult your financial planner or tax adviser to determine the exact tax advantages of any gift you are considering. You will receive an acknowledgment letter, which includes a receipt (via email, for online donations and in the mail for all checks received) that can be used to claim a tax deduction, for all gifts. If you donate and have not already registered, you will receive periodic updates and communications from Texas Scottish Rite Hospital for Children.